After a prolonged period of bitter cold and snow, the winter snapped suddenly on January 19. Bright, crisp sunshine poured over the Northern Alsatian plain, the snow melting into rampaging waters. The Moder burst from its banks to cover miles of the adjoining battlefield. Roads thawed into a quagmire and washed away under Army use. 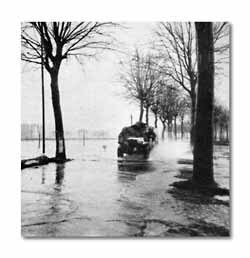 T-Patchers waded in hip-deep water to attack over the flatlands to the Rhine. Before Drusenheim could be won, boggy fields forced a halt. 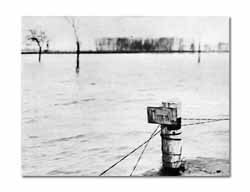 This lone "Minen" sign is the only warning of a German minefield covered by flood waters of the Moder. Trees were the only markers along flood-covered roads. Engineers built miles of wooden platforms to make road passable. 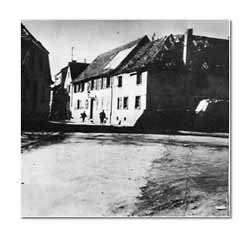 After four days of hard fighting, the Gambsheim pocket ceased to exist. The 143rds well coordinated attack on Rohrwiller gained a decisive advantage. With Herrlisheim and Offendorf threatened by encirclement, the Germans were forced to pull out. From the Drusenheim woods, cleared by men of the 142nd and 143rd, the enemy fell back into Drusenheim. 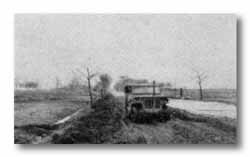 Soft ground and flooded fields foiled the 143rds attack on Drusenheim, a bitter effort across open terrain. 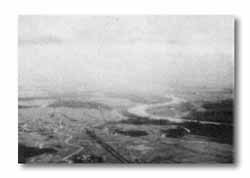 The 141st outposted the Rhine River south of Drusenheim. Earlier the French had moved into Gambsheim, original point of the German threat to Strasbourg. A German 88 captured at Offendorf is turned across the Rhine. Sgt. Albert R. Waldhuber loads shell. 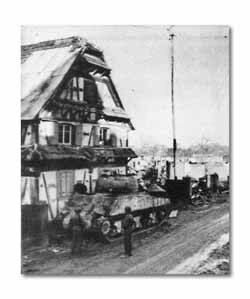 An American tank captured earlier by the Germans at Herrlisheim was abandoned when the enemy evacuated the town. 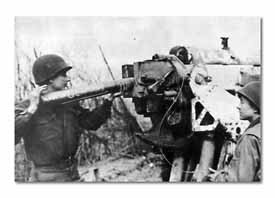 At Drusenheim, on the Rhine, the Germans held fast. Our attacks were discontinued. The Division's fourteenth Congressional Medal of Honor was awarded posthumously to T/Sgt. Morris S. Crane, who was killed while performing his deed at Haguenau on March 13, 1945. 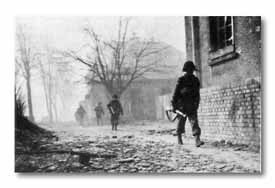 Infantrymen of the 143rd RCT stalk through the streets of Haguenau in file. They are going on patrol. 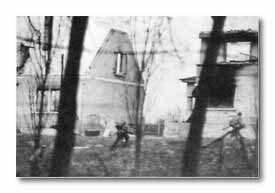 Germans fought with drunken violence to prevent the Americans from taking eleven battered houses across the Moder. "C" Company's 2nd Platoon took eight of the houses, lost five, and then regained all of them. 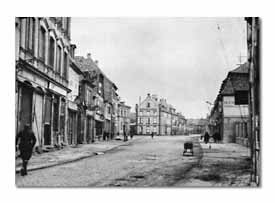 In Haguenau there was comparative quiet, but (above) running civilians have heard the whizzing of an incoming shell. (Below) Captain Alban E. Reid, Jr. (left) and Pfc. 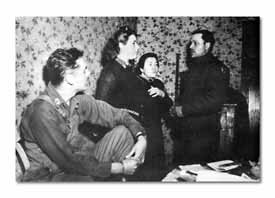 William C. Mech, I Company, 142nd, question two women who are suspected of communicating with the Germans outside Schweighausen.